A Sunday roast never has looked this good! 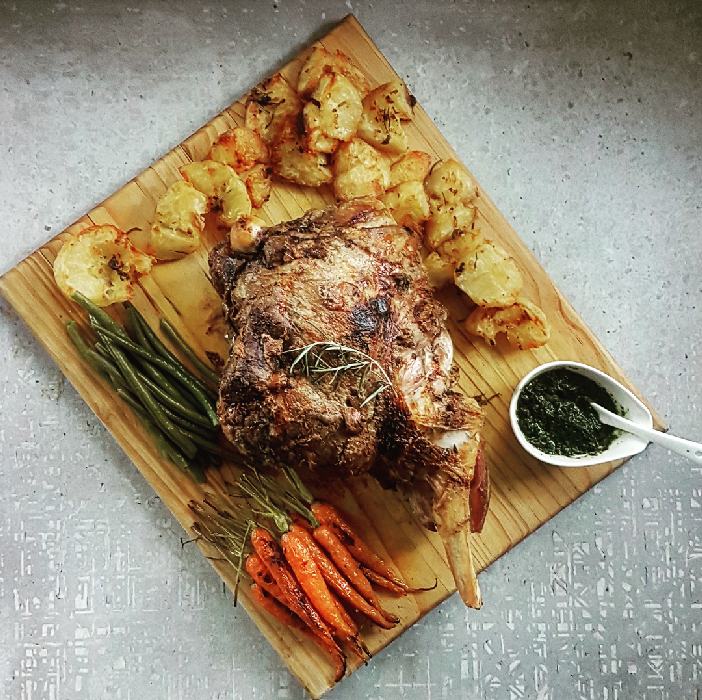 When foodie @rosetickle offered to try out the Eetrite roaster with her roast leg of lamb recipe – accompanied by every delectable trimming imaginable – the Eetrite team couldn’t resist joining her for Sunday lunch. They confirmed - it tastes even better than it sounds! With the festive season fast approaching, our chance to explore rich flavours and take comfort in generous portions does too. Show off your culinary skills with this mouth-watering and sophisticated recipe. 1 tsp. coarsely ground salt. Remove your lamb from the fridge and leave out to come down to room temperature for 1-2 hours. While you wait for the lamb to get to room temperature, you can start prepping the ingredients for stuffing and basting. Group together 3 needles of rosemary, a sliver of garlic and a ¼ of anchovy fillet. You will need 10 -13 of these bundles. Create a paste using a mortar and pestle, or a stick blender by blending the remaining anchovy fillets with 6 garlic cloves, the needles of 4 sprigs of rosemary, a drizzle of olive oil and salt and pepper to taste. Now that your lamb is room temperature, using a sharp paring or utility knife, make 10 – 3 deep incisions (about 5cm deep) into the surface of the lamb (top and bottom). Stuff each incision with the bundles you have created. Rub the leg of lamb with the paste using a basting brush or your fingertips. Heat a large pan or your roaster on the stovetop at a medium – high heat. Drizzle with olive oil and seal each side of the leg of lamb off. Place the lamb onto the triveted baking tray and insert into the oven. Immediately reducing the heat to 170°c. Once your lamb is in the oven, start prepping your potatoes! Peel and quarter the potatoes and boil in salted water until soft. Mix together olive oil, chopped garlic & a good grinding of salt and pepper. When the lamb has about 1 hour to go in the oven, place potatoes in a roasting tray and into the oven with the lamb. Once you have popped the potatoes into the oven, start prepping your carrots! In a bowl, toss the baby carrots with olive oil, sugar, thyme and salt and set aside. Once your lamb has been in the oven for the desired time, remove from the oven and leave to rest for 30 minutes. After removing the lamb, press the potatoes gently with a fork until they burst a little and pour over the rest of the olive oil mixture. Increase the oven temperature to 220°c and add the carrots to the potato tray to roast for 20 - 30 minutes. 15 minutes before the potatoes & carrots are done boil your green beans with the red onion in salted water until slightly tender (approx. 10 minutes) – pour off boiling water and leave to steam dry. Season with a few grinds of salt and butter. Lastly, get your mint sauce ready! Blend mint, sugar, olive oil, and white wine vinegar with a pinch of salt. Place the lamb onto the center of a large wooden board or platter and surround it with love by adding all of the delicious trimmings and mint sauce. Don’t forget your carving set and serving spoons! Let the feasting begin!